Even though we are based out of Jacksonville, FL where it seems fall doesn’t even start until it’s snowing everywhere else, we are OBSESSED with the autumn season inspired food and décor scene. That means we have lots of warm, spicy scented pumpkin or apple “fall everything” from candles and essential oil blends to new shake recipes and treats. However, many of the edible fall goodies are PACKED with way too much sugar or unhealthy ingredients, so we wanted to find a way to appease our cravings while packing in some serious health benefits. And what better way to do it through a fall inspired pumpkin shake with some amazing Juice Plus+ protein mix? This recipe keeps you perfectly full all morning with a protein kick from the gluten-free Complete by Juice Plus+ French Vanilla mix. In a study that compared the antioxidant activity of 26 spices, cinnamon wound up as the clear winner, even outranking “superfoods” like garlicand oregano (Source). This is so good, you will want to make it more than once, so try a few variations, and let us know which one was the best combo! 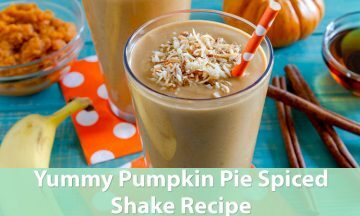 Want another fall smoothie and shake recipe? Try this DELICIOUS sounding Caramel Apple Pie Protein Shake from Dashing Dish.